The purpose of the new shed antler and horn collecting regulations is to reduce stress on wintering big game animals during the time of year when deer, elk, pronghorn antelope and moose are most vulnerable. DENVER — Antler collectors and all people recreating in Colorado are reminded that shed antler and horn collecting is prohibited on all public lands west of Interstate 25 from Friday, March 2, through Monday, April 30. Additionally, in order to maintain protection for the Gunnison sage grouse, the new regulations include a closure to collection of shed antlers on public lands from May 1 to May 15 from sunset to 10 a.m. in the Gunnison River basin. The new regulation was approved by the Colorado Parks and Wildlife Commission in January. Starting next year and in all subsequent years, the seasonal collection prohibition starts on Jan. 1 and continues through April 30. The purpose of this regulation is to reduce stress on wintering big game animals during the time of year when deer, elk, pronghorn antelope and moose are most vulnerable. Stress can result in decreased body condition, increased mortality and decreased survival of deer fawns and elk calves. These regulations protect the health of Colorado’s big game herds and other wintering wildlife. Colorado Parks and Wildlife will be working with recreation organizations, land-use management agencies, visitors bureaus and local communities to get the word out about these new restrictions. Protecting our wintering wildlife is something we have to do together. “As more people enjoy each season that Colorado has to offer, and new forms of recreation continue to emerge, it is increasingly important that everyone involved in outdoor recreation help to educate others about conservation of our public lands,” CPW Director Bob Broscheid said. Anyone violating the closure or who is in possession of antlers or horns during the closure period will be fined at least $68. Even if you are not intentionally looking for antlers you are prohibited from picking up antlers. Because wildlife officers patrol vast areas, CPW is asking for help from the public to enforce the new regulations. If you see activity that appears to be in violation of the closure regulation, please call the nearest CPW office or local law enforcement as soon as possible. Do not, however, confront or approach anyone you suspect is behaving illegally. Previously there were two localized antler collection closures in place, one for public lands in the Gunnison basin and one for public lands in the Eagle and Roaring Fork valleys. The problem with these closures was that it was moving the antler collection pressure to other areas of the state with important winter range habitats. The only other restriction that is also in place is the harassment of wildlife statute, which can be written to any individual who is harassing wildlife, including shed collectors. A harassment ticket is $137. 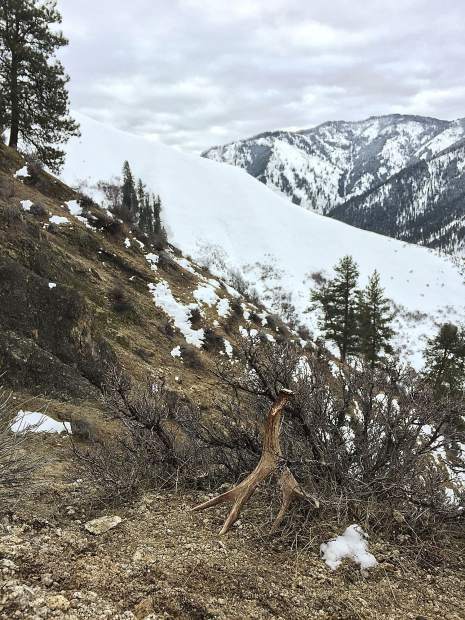 If you are hiking in an area where there is currently a shed antler and horn collecting closure and you see an antler or horn, please leave it alone. There is no way for a CPW officer to differentiate between you and someone who entered the area for the purpose of shed collecting. For more information, go to cpw.state.co.us.